The Ferrari F430 (Type F131) is a sports car produced by the Italian automobile manufacturer Ferrari from 2004 to 2009 as a successor to the Ferrari 360. The car is an update to the 360 with notable exterior and performance changes. It was unveiled at the 2004 Paris Motor Show. The F430 was succeeded by the 458 which was unveiled on 28 July 2009. 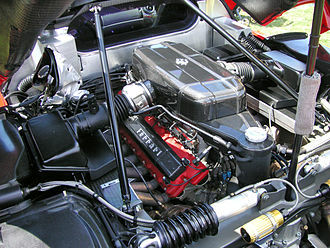 The F430 features a 4,308 cc (4.3 L) V8 petrol engine of the "Ferrari-Maserati" F136 family. This new power plant was a significant departure for Ferrari, as all previous Ferrari V8's were descendants of the Dino racing program of the 1950s. This fifty-year development cycle came to an end with the entirely new 4.3L engine used in the F430, the architecture of which is expected to replace the Dino-derived V12 in most other Ferrari cars. The engine's output specifications are: 490 PS (360 kW; 483 hp), at 8,500 rpm and 465 N⋅m (343 lb⋅ft) of torque at 5,250 rpm, 80% of which is available below 3,500 rpm. 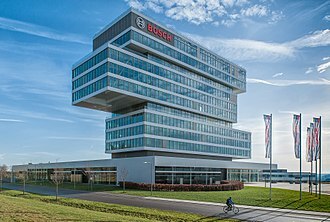 Despite a 20% increase in displacement, engine weight grew by only 4 kg (8.8 lb) along with a decrease in diameter for easier packaging. The connecting rods, pistons and crankshaft were all entirely new, while the 4-valve cylinder head, valves and intake trumpets were directly retained from Formula 1 engines, for ideal volumetric efficiency. The F430 has a top speed in excess of 196 mph (315 km/h) and can accelerate from 0 to 60 mph (97 km/h) in 3.6 seconds, 0.6 seconds quicker than the old model. The brakes on the F430 were developed in close cooperation with Brembo and Bosch, resulting in a new cast-iron alloy for the discs. 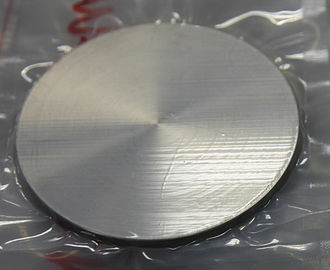 The new alloy includes molybdenum which has a better heat dissipation performance. The F430 was also available with the optional Carbon fibre-reinforced Silicon Carbide (C/SiC) ceramic composite brake package. Ferrari claims the carbon ceramic brakes will not fade even after 300-360 laps at their test track. 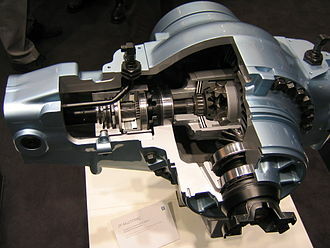 The F430 featured the E-Diff, a computer-controlled limited slip active differential which can vary the distribution of torque based on inputs such as steering angle and lateral acceleration. 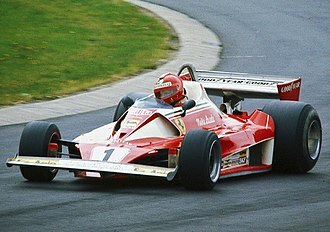 Other notable features include the first application of Ferrari's manettino steering wheel-mounted control knob. Drivers can select from five different settings which modify the vehicle's ESC system, "Skyhook" electronic suspension, transmission behavior, throttle response, and E-Diff. The feature is similar to Land Rover's "Terrain Response" system. The Ferrari F430 was available with exclusive Goodyear Eagle F1 GSD3 EMT tires, which have a V-shaped tread design, run-flat capability, and OneTRED technology. In the US, the company requested an exemption from the airbag design requirements, which was eventually granted, allowing the car to continue to be sold in the US. The MSRP for a Ferrari F430 was $186,925 to $217,318 in the United States, £119,500 in the United Kingdom, approximately €175,000 in the European Union, and $379,000 for the base model to $450,000 for the Spider in Australia and New Zealand. The F430 Spider is the convertible version based on the coupé. It was unveiled at the 2005 Geneva Motor Show, making it Ferrari's 21st road going convertible. 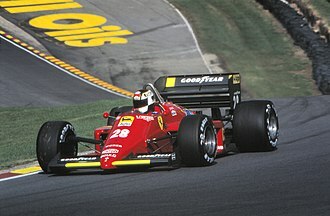 The car was designed by Pininfarina with aerodynamic simulation programs used for Formula 1 cars. The conversion from a closed top to an open-air convertible is a two-stage folding-action, the roof panel automatically folds away inside a space above the engine bay. The interior and performance of the Spider is identical to that of the coupé with increase in the weight and decrease in the top speed by 3 mph (5 km/h). The F430 Challenge is the track version of the F430, designed for the Ferrari Challenge. The engine remained untouched but the vehicle's weight was reduced, resulting in a top speed of 202 mph (325 km/h). 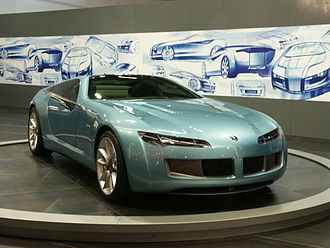 The production model was unveiled at the Los Angeles Auto Show in January, 2005. Serving as the successor to the Ferrari 360 Challenge Stradale, the 430 Scuderia (scuderia meaning "stable" , but also used in the context of motor racing teams, including Ferrari's own) was unveiled by Michael Schumacher at the 2007 Frankfurt Auto Show. Aimed to compete with cars like the Porsche RS-models and the Lamborghini Gallardo Superleggera (superleggera meaning super light weight), it is lighter (by 100 kg (220 lb)) and more powerful (510 PS (375 kW; 503 hp) at 8,500 rpm and 471 N⋅m (347 lb⋅ft) of torque at 5,250 rpm) than the standard F430. Increased power comes from a revised intake, exhaust, and an ion-sensing knock-detection system that allows for a higher compression ratio] in the engine. Thus the weight-to-power ratio is reduced from 2.96 kg/hp to 2.5 kg/hp. In addition to the weight saving measures, the Scuderia semi-automatic transmission gained improved "Superfast", known as "Superfast2", software for faster 60 millisecond shift times. A new traction control system combined the F1-Trac traction from the 599 GTB and stability control with the E-Diff electronic differential. The Ferrari 430 Scuderia accelerates from 0-100 km/h (62 mph) in 3.6 seconds, with a top speed of 198 mph (319 km/h). Although the 430 Scuderia was not available with a manual transmission, a Texas based tuning company fitted a 430 Scuderia with a manual transmission sourced from Ferrari thus making it the only example in the world to have a manual transmission. To commemorate Ferrari's 16th victory in the Formula 1 Constructor's World Championship in 2008, Ferrari unveiled the Scuderia Spider 16M at World Finals in Mugello. It is a convertible version of the 430 Scuderia. The engine produces 510 PS (375 kW; 503 hp) at 8,500 rpm and 471 N⋅m (347 lb⋅ft) of torque at 5,250 rpm. The car has a dry weight of 1,340 kg (2,954 lb) (80 kg (176 lb) lighter than the F430 Spider) and a curb weight of 1,440 kg (3,175 lb). The chassis was stiffened to cope with the extra performance available and the car featured many carbon fibre parts as standard. 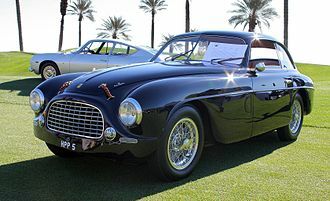 Specially lightened front and rear bumpers (compared to the 430 Scuderia) were a further sign of the efforts Ferrari was putting into this convertible track car for the road. Unique 5-spoke forged wheels were produced for the 16M's launch and helped to considerably reduce unsprung weight with larger front brakes and calipers added for extra stopping power (also featured on 430 Scuderia). It accelerates from 0–100 km/h (0–62 mph) in 3.7 seconds, with a top speed of 315 km/h (196 mph). 499 cars were produced beginning early 2009 and all were pre-sold to select clients. A version of the F430 Spider that runs on ethanol, called the F430 Spider Bio Fuel, was on display at the 2008 Detroit Auto Show. It had the same 4.3 litre V8 engine as the standard car, producing 500 hp (373 kW), with a 4% increase in torque, with 5% less carbon dioxide emissions than the standard F430 Spider. The F430-based Ferrari SP1 (Special Project Number 1), was the first one-off special produced by the Ferrari Portfolio Program. The body was designed by former Pininfarina designer Leonardo Fioravanti, at the behest of Junichiro Hiramatsu, a Japanese businessman who was the former president of the Ferrari Club of Japan and an avid collector; he had admired Fioravanti's 1998 F100 prototype. Risi Competizione's F430 GTC at the American Le Mans Series' Road America 500. Built since 2006 by Ferrari Corse Clienti department in collaboration with Michelotto Automobili, the F430 GTC is a racing car designed to compete in international GT2 class competition, such as in the American Le Mans Series, Le Mans Series, and FIA GT Championship. F430 GTCs also compete at the 24 Hours of Le Mans. 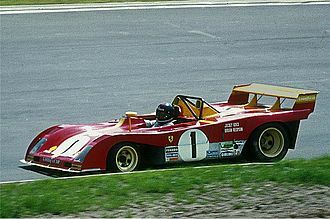 The GTC was the fastest and most developed racing version of the F430. In FIA GT2 championship, in order to render the car performances more uniform, the cars are forced to run with a specific minimum weight and with an engine restrictor that depends on the engine displacement. 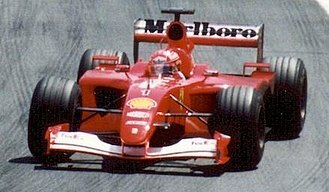 Hence Ferrari destroked the 4.3 L V8 engine to 4.0 L in order to compete in the 3.8–4.0 L class in GT2 class racing, which is allowed to race with a minimum weight of 1,100 kg (2,425 lb). In this race configuration, the engine produces somewhat less power and by using the 4.0 L engine, the minimum weight of the F430 would increase by 50 kg (110 lb). but this is compensated by the reduced weight of the car, which yields a better Power-to-weight ratio. The F430 GTCs won their class championships in the ALMS and FIA GT, as well as scoring class wins at the 2007, 2009 and 2010 12 Hours of Sebring, at the 2008 and 2009 24 Hours of Le Mans and at the 2008 and 2009 Petit Le Mans. Originally based on the F430 Challenge, the F430 GT3 is a specialized racing car developed in 2006 by JMB Racing for the FIA GT3 European Championship and other national GT championships such as British GT and FFSA GT. It is mechanically similar to the F430 Challenge, but has better developed aerodynamics and more power. The car uses the same 4.3 L V8 engine, tuned to produce 550 hp (410 kW; 558 PS), making the GT3 more powerful than its GT2 counterpart. However, due to the GT3 regulations stating that the car must have a power-to-weight ratio of around 2.6 kg/hp, the car weighs 1,219 kg (2,687 lb) in race trim (driver and fuel excluded), which is roughly 119 kg (262 lb) more than the GT2 spec car. Despite the higher power, it is significantly slower than the GT2 version; for example, in the 2007 Spa 24 Hours endurance race, in which both models were entered, the GT3 spec vehicles' best qualification time was around 8 seconds slower per lap than that set by the GT2 spec vehicle. Developed by Kessel Racing for the 2009 season, the 430 GT3 Scuderia is the successor of the previous F430 GT3. In February 2009, Ferrari recalled about 2,000 2005–2007 F430 Spiders in the U.S., due to the risk that heat from the engine could cause the soft top hydraulic hoses to fracture and leak flammable fluid onto the V8 engine, resulting in a fire. ^ "Who's Where: Frank Stephenson appointed Director of Design for Alfa Romeo". cardesignnews.com. Archived from the original on 2007-10-20. Retrieved 2007-12-13. ^ "2006 Chevrolet Corvette Z06 vs. 2006 Ferrari F430, 2007 Porsche 911 Turbo" (PDF). ^ "2006 Ferrari F430 Spider F1 vs. Lamborghini Gallardo Spyder" (PDF). ^ "2009 Ferrari 430 Scuderia Spider 16M Second Drive". ^ "2008 Ferrari 430 Scuderia First Drive Review". ^ a b c "2005 Ferrari F430 Press Release Kit". Ferrari Press Release. Retrieved 2007-04-17. ^ "2010 Ferrari 458 Italia Press Release Kit". 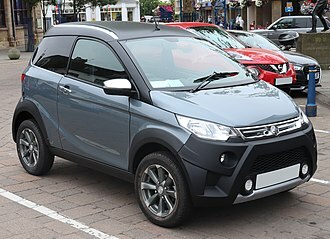 carsuk. Retrieved 2009-07-28. ^ "F430". Ferrari GT - en-EN. Retrieved 18 September 2015. ^ "F430". Ferrari GT - en-EN. Retrieved 12 December 2014. ^ "Evil Twins: Ferrari F430 vs. 430 Scuderia". road and track. 2008-02-15. Retrieved 2017-12-07. ^ "Car brakes". Brembo. Archived from the original on 2009-07-16. Retrieved 2009-07-15. ^ "First Drive: 2005 Ferrari F430". Edmunds.com. 2004-10-14. Retrieved 2009-07-15. ^ "Ferrari 430 Gets Airbag Exemption". Leftlane News. 2006-05-22. Retrieved 2011-03-24. ^ "2006 Ferrari F430 Styles". Edmunds.com. ^ "Ferrari 430". Channel4 UK. ^ "Designs on Geneva" (PDF). Retrieved 2012-01-28. ^ "First Drive: 2008 Ferrari 430 Scuderia". Edmunds.com. 2007-09-30. Retrieved 2009-07-15. ^ "Grafici 430 Scuderia". Ferrari S.p.A. Retrieved 2010-04-07. ^ "Technical Specifications". evo magazine. 2007-12-06. Retrieved 2017-12-08. ^ "1 Of 1 Ferrari 430 Scuderia Manual Transmission Available". Autoclassics.com. Retrieved 2019-03-20. ^ "430 Scuderia from European Auto Group". ^ "Tire Rack Michelin Pilot Sport 4S". ^ "NEW MODEL: FERRARI SCUDERIA SPIDER 16M". italiaspeed.com/2008/cars. Retrieved 2008-12-19. ^ Abuelsamid, Sam (2008-11-09). "Officially Official: Ferrari Scuderia Spider 16M to celebrate F1 title". Autoblog.com. Retrieved 2010-09-30. ^ a b "Ferrari F430 Spider Bio Fuel – 2008 Detroit Auto Show". Motortrend. 2008. Retrieved 2010-08-20. ^ "Ferrari SP1". 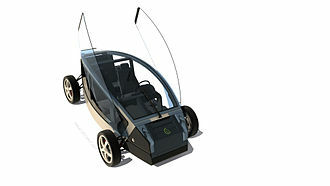 Carbodydesign.com. 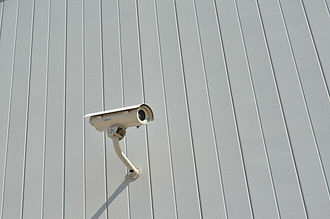 2008-11-12. Retrieved 2010-07-07. ^ a b c "FIA GT 2007–2008 Sporting Regulations, Article 257, Appendix 1, Restrictors for Normally Aspirated Engines, 2007" (PDF). Retrieved 2010-09-30. ^ "55th Annual Mobil 1 Twelve Hours of Sebring" (PDF). imsaracing.net. Archived from the original (PDF) on 2009-03-20. Retrieved 2009-11-25. ^ "Ferrari F430 GT3 Specifications". gt3europe.com. Retrieved 2010-10-20. ^ Nate Martinez (Feb 17, 2009). "Nearly 2000 Ferrari F430 Spiders Recalled for Potential Fire Issues". Motor Trend-WOT blog. Holmes, Mark (2007). Ultimate Convertibles: Roofless Beauty. London: Kandour. pp. 68–69. ISBN 978-1-905741-62-5. Wikimedia Commons has media related to Ferrari F430. 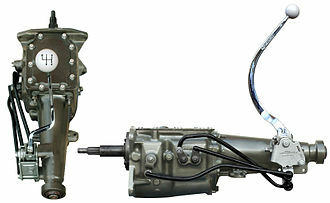 In automobiles and other wheeled vehicles, the differential allows the outer drive wheel to rotate faster than the inner drive wheel during a turn. This is necessary when the vehicle turns, making the wheel that is traveling around the outside of the turning curve roll farther and faster than the other, the average of the rotational speed of the two driving wheels equals the input rotational speed of the drive shaft. 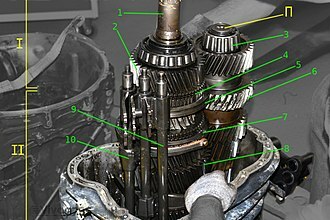 An increase in the speed of one wheel is balanced by a decrease in the speed of the other, when used in this way, a differential couples the input shaft to the pinion, which in turn runs on the ring gear of the differential. 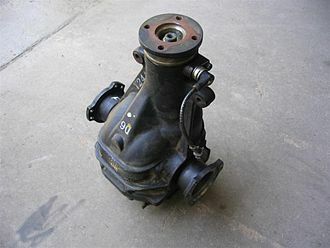 This works as reduction gearing, on rear wheel drive vehicles the differential may connect to half-shafts inside an axle housing, or drive shafts that connect to the rear driving wheels. 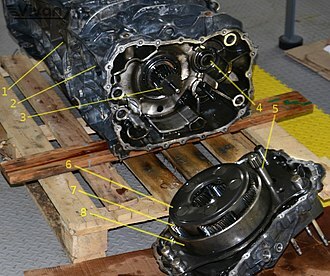 Front wheel drive tend to have the pinion on the end of the main-shaft of the gearbox. 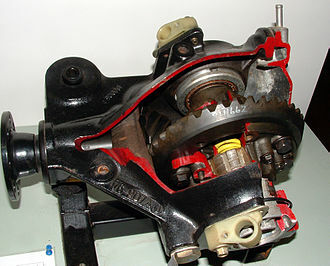 There are individual drive-shafts to each wheel, non-automotive uses of differentials include performing analog arithmetic. The ball was painted black and white in hemispheres, and graphically showed the phase of the moon at a point in time. See the Chinese South-pointing chariot, an equation clock that used a differential for addition was made in 1720. In the 20th Century, large assemblies of many differentials were used as analog computers, for example, the development of electronic digital computers has made these uses of differentials obsolete. 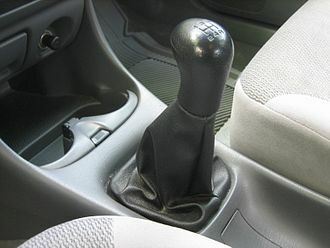 Practically all the differentials that are now made are used in automobiles, there are many claims to the invention of the differential gear, but it is possible that it was known, at least in some places, in ancient times. Some historical milestones of the include,100 BC–70 BC. Some such chariots may have used differential gears,658,666 AD, two Chinese Buddhist monks and engineers create south-pointing chariots for Emperor Tenji of Japan. 1720, Joseph Williamson uses a gear in a clock. 1810, Rudolph Ackermann of Germany invents a four-wheel steering system for carriages,1827, modern automotive differential patented by watchmaker Onésiphore Pecqueur of the Conservatoire National des Arts et Métiers in France for use on a steam wagon.